Like Jupiter, Saturn and Uranus, Saturn is a gas giant. Although it is the smallest of the four. 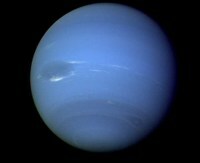 Neptune’s cloud called the ‘scooter’ moves around Neptune every 16 hours. After Pluto was declassified as a planet, Neptune became the farthest planet from the sun. Neptune has a rocky core. Neptune is so far away that it took the space probe Voyager 2, 12 years to reach it. Because Pluto's orbit is so eccentric, it sometimes crosses the orbit of Neptune making Neptune the most distant planet from the Sun for a few years. Neptune's composition is probably similar to Uranus': various "ices" and rock with about 15% hydrogen and a little helium. Like Uranus, but unlike Jupiter and Saturn, it may not have a distinct internal layering but rather to be more or less uniform in composition. But there is most likely a small core (about the mass of the Earth) of rocky material. Its atmosphere is mostly hydrogen and helium with a small amount of methane.